Central heating control systems Dublin help to power up every home seamlessly! A low consumption compressor, which is responsible for the circulation of the liquid throughout the whole system. An Expansion component that reduces the boiling temperature from approximately -30°C so that it can go back to the thermodynamic solar panels and capture heat again. What are some things you look for in water heating systems? Well for starters you want them to work and for a very long time. So durability is a big factor because this is not a purchase you plan on making anytime soon. Another thing you look for is if it will work with the other appliances in your home or building? There’s no point in upgrading one thing if it’s not compatible with everything else. Finally, you want to know that this choice is going to save you money over a lengthy period of time. Sometimes we focus too much on getting a great deal now that we ignore the overall cost it will have for us. When you are buying a car you always take a look at the gas mileage because you know that you can spend anywhere from $50-$200 a month on gas. Why don’t you look at the same thing when you are researching appliances for the home? If you can buy something that cuts your energy usage down significantly and saves you hundreds of dollars a year, doesn’t it eventually pay for itself? That’s one of the main reasons why so many people are looking into solar options, because they understand the long-term benefits it has for not only themselves but for the environment. Technology is greatly improved: You don’t have to rely on perfectly sunny days in order to get a full charge. Technology relies on solar radiation to work and you can enjoy plenty of heat for days, even if the weather isn’t ideal. More options: You can now improve your appliances in the kitchen, bathroom, laundry room and all around the house. Rather than buying one unit that may or may not work for the entire house, you can pick and choose what you want specifically and it will work for years. More affordable: One of the main reasons people are more on board with solar energy than ever is because it’s very affordable. For prices that are very competitive with standard appliances, you can get brand new central heating control systems. However, with solar, you are able to save hundreds of dollars a year in energy usage. The thermodynamic solar central heating system is a highly efficient method of providing an economic solution to heating housing. The advanced technology used allows our system to obtain high performance and acquisition of an efficient heating source. Thanks to the possibility to capture various renewable energy sources like the sun, wind and rain, the thermodynamic solar systems present themselves as the solution that helps reduce energy consumption without greenhouse gas emissions thermodynamic solar systems provide great benefits for the environment. A single system can ensure the central heating and domestic hot water production house providing absolute comfort in both applications. The problem with keeping your old central heating control systems is that while they may still work, they are costing you hundreds of dollars a year in energy usage. The majority of our customers and people throughout Ireland who make the switch to solar power aren’t doing it because their current appliances begin to break down. They are doing it because they know how much their energy bill has gone up over the past decade and it will only continue to go up in the years to come. Keeping your home or business warm isn’t something you can opt out of, it has to be done and finding a cost-effective way of keeping it warm should be your goal. The thing to remember about solar appliances is that things have changed a lot from a decade ago. Bulky panels that were hard to install, expensive and rarely worked the right way have been replaced with new technology. Now, installation can be done in less than a day and you will see a major improvement in the efficiency of the technology as it works in even the harshest weather conditions. That’s something that everyone can benefit from and should. So where and when should you start as you begin looking at the options that are available to you? LVP Renewables helps residential and commercial complexes power up their central heating systems by recommending the use of solar blocks. Central heating controls act as the core of your heating system. It decides when a boiler or heat pump should be ‘on’. A low consumption compressor, which is accountable for the movement of the liquid throughout the system. A Heat exchanger that disperses heat into the water for consumption (Domestic use) or a closed heating circuit (Central Heating). An Extension component that condenses the boiling temperature from approximately -30°C so that it can go back to the thermodynamic solar panels and capture heat again. Guarantee of heating water even in the coldest temperature. A possibility of joining all house equipment into just one heating solution. Compatible with radiators, under house heating, fan coils and so on. Great for new buildings and retrofits. Flexibility to adjust the temperature inside, depending on the temperature outside. Control the heating systems from smartphone applications. Central heating controls Dublin come with custom applications that are available for every type of residential and commercial setup for every locality. 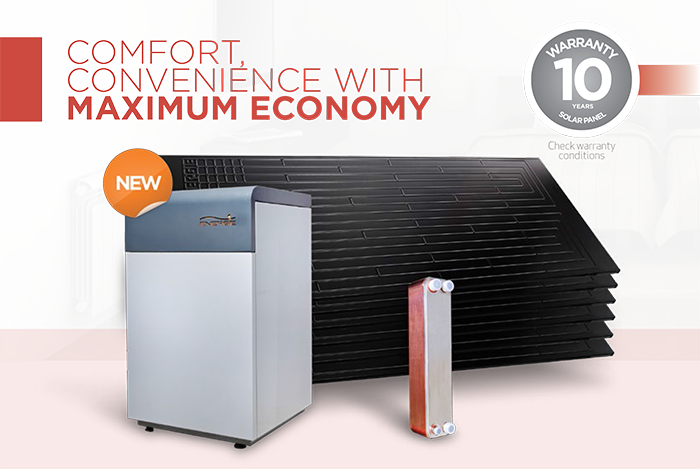 It is one of the most economical solutions to heating housing complexes across the city. Keeping homes and businesses centrally heated in cold weather is not an option but a necessity in today’s time and age. With increasing costs associated with electricity and other sources of energy, LVP renewables provide customers with the option of installing pocket-friendly central heating control systems Dublin and other surrounding cities. LVP Renewables can help you find the best central heating control systems at affordable prices based on your needs. It doesn’t matter if you are trying to find something for your home or for an entire office building or warehouse, we have the selection you need at prices you will be happy with. Even better than low prices is the fact that you will be saving hundreds of dollars a year on your energy cost and benefit from a cleaner form of power for years to come. Call us today to learn more.